When Katherine Rundell was searching for an idea for her second children’s novel she felt cursed with second novel syndrome. So she turned to her own childhood and remembered her fascination with tightrope walking and the incredible bravery of people who take to the skies with only their own agility to keep them from falling. Katherine Rundell was at Our Lady's Abingdon with 300 schoolchildren from across Abingdon to celebrate the launch of ‘Rooftoppers’ on Mar 7 and to talk about the high-wire act that writing can sometimes be. She was brought up in Zimbabwe and so inspired by the feat of Philippe Petit walking between New York’s twin towers, she strung her own rope between two trees to try to teach herself to tightrope walk. Her parents eventually sent her to circus school to try to stop her injuring herself. 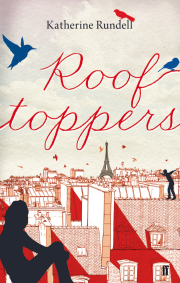 In ‘Rooftoppers’, baby Sophie is rescued from a sinking ship and brought up by scholarly Charles in London. He concentrates on teaching her what he feels is important, which involves lots of books and music and very irregular meals. The authorities are never far away and when it looks as though Charles’ eccentric upbringing will end in Sophie being taken to an orphanage, the pair, following a clue, head to Paris to try to find out if Sophie’s real mother really did die when the ship sank. Now wanted by the police, but determined to still search for her mother, Sophie gets help from a bunch of children she meets living on the Paris rooftops. She starts a totally different adventure, joining the rooftoppers and learning to leap between buildings, catching birds to eat and only coming out after dark. She has to learn to tightrope and scale ancient buildings to keep up with them and keep a step away from anyone trying to catch them as together they follow the only clue they have – that Sophie’s mother played the cello. It’s an exciting story, full of pace and adventure and Katherine was full of advice at the book launch of how to take an idea and turn it into a great book. 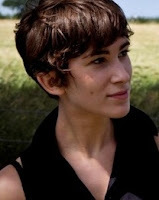 Katherine has drawn on her own unique life for inspiration to come up with her stories and eccentric characters. 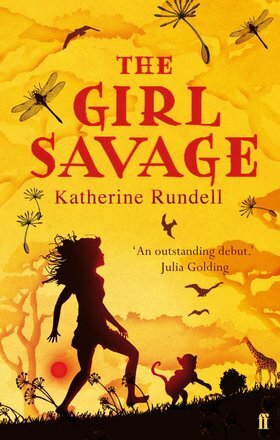 Although set in a different place and a different time there are similarities between ‘Rooftoppers’ and with Katherine’s first book ‘The Girl Savage’. Her first book she wrote in a month, and based it mostly on her own wild childhood growing up in Africa. In the story Wilhelmina (Will) is sent from Africa to an English boarding school, where she discovers that all the skills and knowledge that served her so well in Africa are useless in her new environment, so runs away and finds she can live quite happily for in London Zoo, while seeing if she can find the bravery to return to her restrictive school environment. They are both great stories about being yourself, not fitting in, as well as out-and-out adventure tales, full of eccentric twists, imaginative word play and a theme of believing the impossible and not letting go of your dreams. Her second book took two-and-a-half years to write, which she admits, was down to fear of being judged by the 9,000 people who’d bought her first book. But she does admit to sometimes having to tie herself to her chair to make herself write. For her inspiration, like in her first book, she turned again to ways to escape when you feel you don’t fit in. At 21 she was by far the youngest fellow of All Souls in Oxford and felt she was the only person there who was looking for adventure. She would often imagine someone might be having an adventure up on the vast rooftops and thought rooftops would be a good place to live if you didn't want to be seen. Her personal dream has always to be an explorer and go to the South Pole, like Scott, and has high hopes she might still get to go there one day. An adult murder mystery and a sequel to Rooftoppers and a doctorate on John Donne. I don’t think I have been given many writing tips, but the one I remember is to get to the end so you can start again at the beginning. Children are better readers than adults, they are more imaginative and they remember what they have read. The worst thing is deadlines. I have a special book that I write in. I write always with a cup of tea and black chocolate. The first time you get published is the biggest. That and getting Philip Pullman to promote the book was lovely.